Near Pattaya, on 1st June 1945 saw the MS. Suddhadib or aka Hardeep being sunk by an air attack of Allied Forces, consisting of British, Australian and Canadians crews. The Suddhadib quickly sunk with no loss of life, the crew swam to Koh Chuang. There's one page on this site completely devoted to the MS. Sudahib and well worth reading. 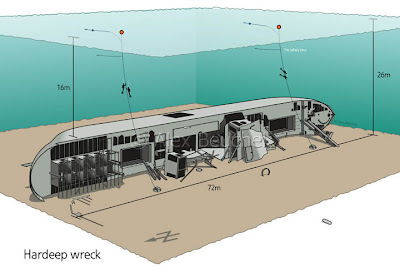 Interestingly enough, new CAD generated wreck imagery has been added to this page with very detailed images of the wreck. If in Pattaya and you're interested in diving, don't miss out on of the wrecks around Pattaya or contact me for setting up a trip to Pattaya if you're visiting Samui.